Area 5: Download a printable PDF version of this map. Area 105: Download a printable PDF version of this map. Chinook Salmon Coastwide Annual Limit Pieces 10 - The total annual limit for chinook salmon is 10 from all tidal waters. 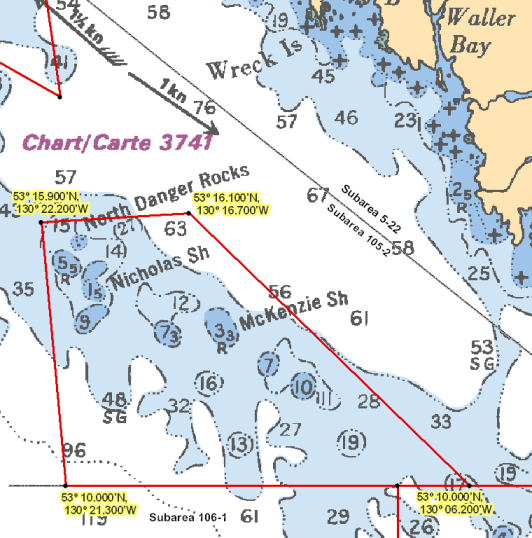 Crab 5,105 Reminder Combined daily limit for Dungeness crab, red rock crab, box crab, Puget Sound king crab and all other king crab is 6. 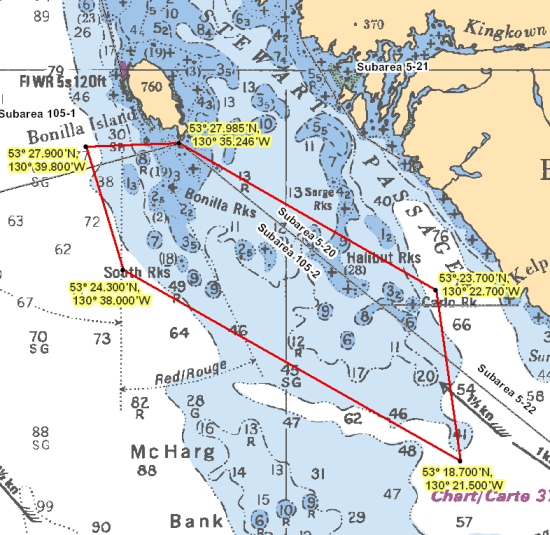 Coastwide Annual Limit Pieces 10 - The total annual limit for chinook salmon is 10 from all tidal waters. 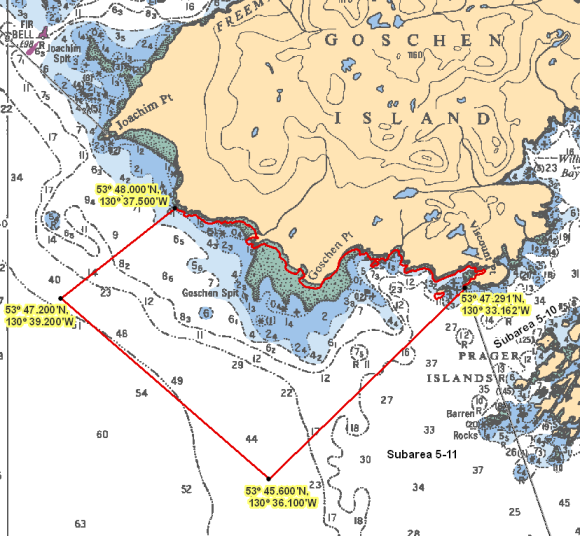 Herring 5,105 Reminder Harvesting of herring roe from marine plants or plants placed in the water for the purpose of harvesting herring roe is prohibited. Codfish 5,105 Reminder Species includes: Pacific cod, Pacific tomcod, pollock and hake but does not include lingcod. 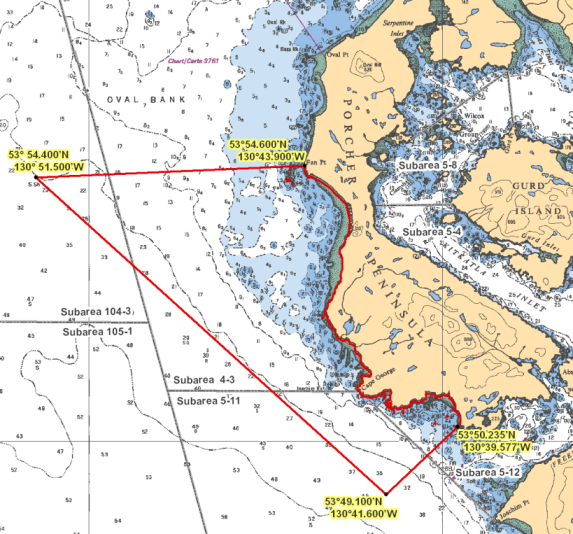 North Danger Rocks North_Danger_Rocks.png Those waters of Subarea 105-2 that lie inside a line that begins at 53°15.900'N 130°22.200'W in water then to 53°16.100'N 130°16.700'W in water then to 53°10.000'N 130°06.200'W in water then to 53°10.000'N 130°21.300'W in water then to the beginning point. 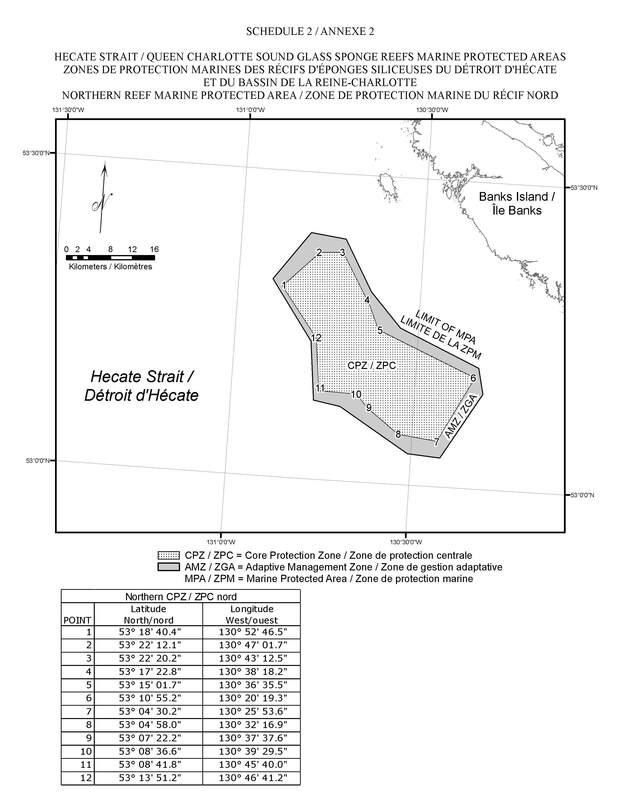 Northern Reef MPA Northern_Reef_MPA.jpeg Northern Reef core protection zone: Those waters of Subareas 105-2 and 106-1 below a depth of 100m below the sea surface that lie inside a line that begins at 53°18'40.4" N 130°52'46.5" W, then southerly to 53°22'12.1"N 130°47'01.7"W, then to 53°22'20.2"N 130°43'12.5"W, then to 53°17'22.8"N 130°38'18.2"W, then to 53°15'01.7"N 130°36'35.5"W, then to 53°10'55.2"N 130°20'19.3"W, then to 53°04'30.2"N 130°25'53.6"W, then to 53°04'58.0"N 130°32'16.9"W then to 53°07'22.2"N 130°37'37.6"W, then to 53°08'36.6"N 130°39'29.5"W, then to 53°08'41.8"N 130°45'40.0"W, then to 53°13'51.2"N 130°46'41.2"W, then to the beginning point. Porcher Peninsula Porcher_Peninsula.png Those waters of Subareas 4-3, 5-11, 5-12, and 104-3 that lie inside a line that: begins at 53°54.400'N 130°51.500'W in water then to 53°54.600'N 130°43.900'W Fan Point then southerly following the shoreline of Porcher Peninsula to 53°50.235'N 130°39.577'W Porcher Peninsula then to 53°49.100'N 130°41.600'W in water then to the beginning point.